Are science and religion doomed to eternal “warfare,” or can they just get along? Philosophers, theologians, scientists and atheists debate this subject endlessly (and often, angrily). We hear a lot less from economists on the matter, however. But in a recent paper, Princeton economist Roland Bénabou and two colleagues unveiled a surprising finding that would at least appear to bolster the “conflict” camp: Both across countries and also across US states, higher levels of religiosity are related to lower levels of scientific innovation. That’s the most salient finding from the paper by Bénabou and his colleagues, which uses an economic model to explore how scientific innovation, religiosity and the power of the state interact to form different “regimes.” The three kinds of regimes that they identify: a secular, European-style regime in which religion has very little policy influence and science garners great support; a repressive, theocratic regime in which the state and religion merge to suppress science; and a more intermediate, American-style regime in which religion and science both thrive, with the state supporting science and religions (mostly) trying to accommodate themselves to its findings. It is in the process of this inquiry on the relationship between science, religion and the state that the researchers dive into an analysis of patents, both in the United States and across the globe. And the results are pretty striking. First, the researchers looked at the raw data on patents per capita (taken from the World Intellectual Property Organization’s data) and religiosity (based on the following question from the World Values Survey: “Independently of whether you go to church or not, would you say you are: a religious person, not a religious person, a convinced atheist, don’t know”). And they found a “strong negative relationship” between the two. 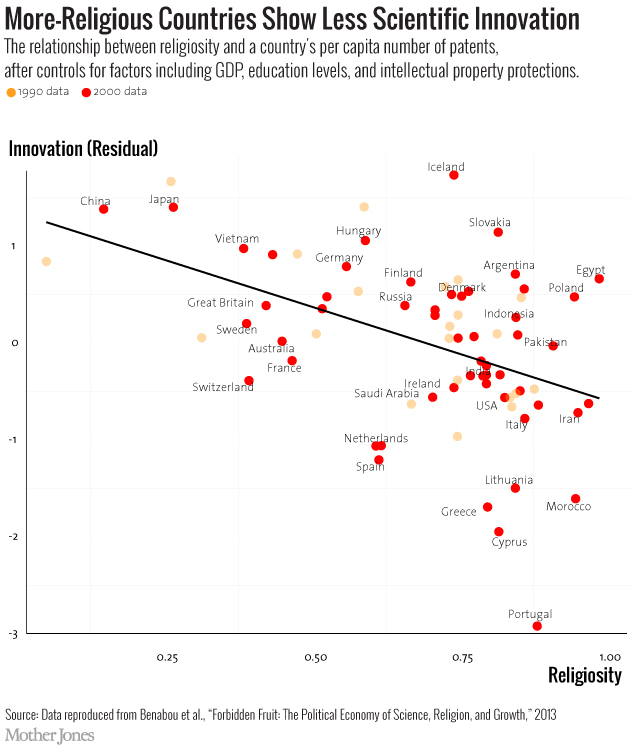 In other words, for countries around the world, more religion was tied to fewer patents per individual residing in the country. One important point of to keep in mind before comparing individual countries with one another: The figure above should not be interpreted as saying (for example) that China produces more patents per capita than the United States. Indeed, that isn’t actually true: While Chinese residents filed more total patent applications (560,681) in 2012 than citizens of any other country including the United States (460,276), the US still filed more patents per capita, since its population is less than a third of China’s. Rather, what this result means is that after controlling for other factors, China appears to have more unexplained innovation “left over” than the United States. (For stats nerds: What we are talking about here is the residual after a regression analysis.) It is this leftover or residual value — the differences in innovation that can’t be explained by other factors — that the researchers are saying is associated with religion. 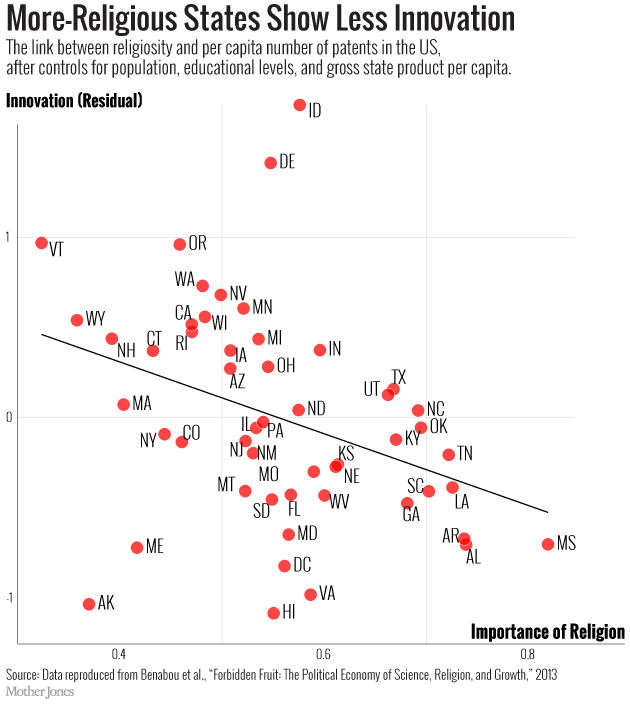 Note that states like Vermont and Oregon are highly innovative and not very religious, whereas innovation lags in states like Arkansas and Mississippi, even as religion thrives. The authors note in their paper, however, that while the Bible Belt states tend to show the most religion and least innovation, the finding does not depend on them. “The negative association holds throughout the sample,” they write. Once again, before going and trying to compare states with one another: Keep in mind that the figure above does not mean that Delaware or Idaho produce more patents per capita than Massachusetts or California. Once again, it simply means that Delaware and Idaho have more “left over” — or residual — innovation after other factors are controlled for. Doing so, it would seem, lends support to the science-religion conflict thesis: the idea that in places where religion predominates, inquiry truly does take a hit. Chris Mooney is a science and political journalist, podcaster and the host of Climate Desk Live. He is the author of four books, including the New York Times bestselling The Republican War on Science. Follow him on Twitter: @chriscmooney.